The Easter weekend brought beautiful autumn weather with (mainly) clear skies and temperatures in the low 20s. My lady and I hadn’t been planning a SOTA expedition but on a day like this, what else were we to do? We had a quick look at the map and decided to activate a couple of nearby Summits that had been on the to-do list for some time: Mount Jack VK3/VE-090 (8 points) and Mount Stanley VK3/VE-126 (6 points). Both looked easily accessible, being within an hour’s drive of home. We decided to tackle Mt Jack first and then approach Mt Stanley from the south. Access to Mt Jack is via the Happy Valley Road, and there are two trails shown on the topographic map that go to the summit. These are the Mount Jack Track (obvious, really) and the so-called Happy Valley Track. Neither are well signposted and we drove straight past the Mt Jack Track, but decided to carry on and take the Happy Valley Track instead. We missed that one as well, but it turned out that it isn’t actually called the Happy Valley Track at all. Its real name is the Rosewhite Track, and it is signposted from the Happy Valley Road even though the sign is very small, almost hidden in the undergrowth and nearly invisible if you approach from the east as we did. Having found the trail and confirmed via the GPS that it was the one we were looking for, we headed up the hill. The trail is quite well graded, perhaps a little rough in places, but not too steep and negotiable in a 2WD or AWD vehicle with care. As with most of these bush trails, it’s not a good idea to try this one in the wet. We found all of the trails in the area to be well signposted once off the main road and locating the summit is no trouble at all. 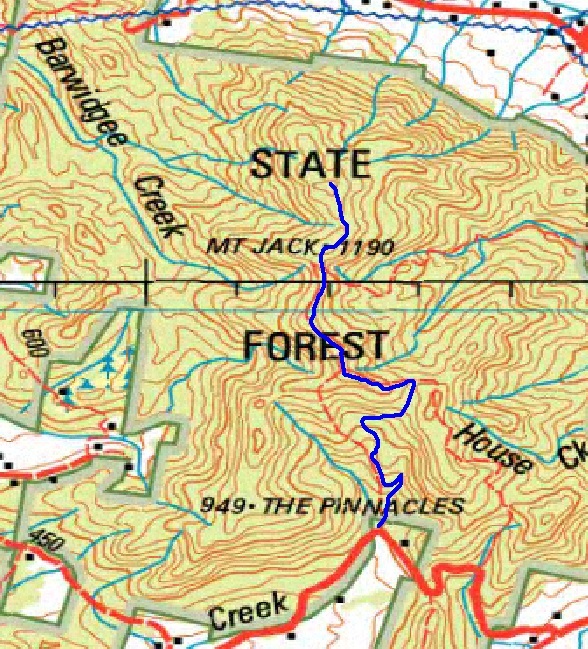 Some maps do get a little confused and show Mount Jack as being the southernmost of two high points. The SOTA Summit is the northernmost one, being some 20m higher than the other. The Summit is well forested and we had no trouble finding a suitable antenna support in the shape of a convenient tree close to the trail. The station set-up proceeded like a well-oiled machine and we were on the air within ten minutes of arriving. There was enough of a 3G signal to post a spot via SOTA Watch and in about 20 minutes of operating on 7MHz SSB I worked VK1MBE/P (S2S), VK1EM, VK2DAG/P (S2S), VK3EK, VK1MA, VK2CCJ, VK3MRG, VK1NAM/P (S2S), VK3CAT/P (S2S), VK3UBY, VK5PAS, VK3AFW, VK5LY, VK3YN, VK3IL/P, VK3FQSO, VK3BYD, VK3ASC, VK3FB/P, VK3FPSR, VK2IO, VK3HRA/P (S2S) and VK2YW. When there were no more takers we took a break for lunch and then packed up and moved on to our next Summit, Mount Stanley. This is a very easy drive on a well graded, gently sloping road when approaching from the village of Stanley, to the north of the Summit. We decided this was a bit boring and so we chose to approach from the south, which is a different proposition altogether. 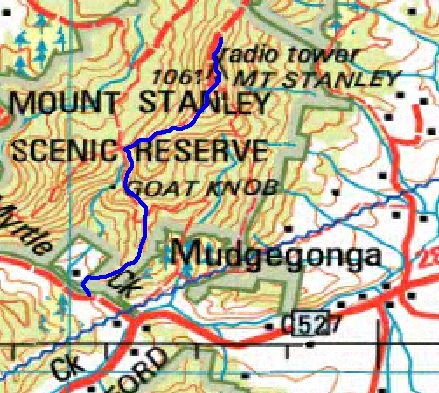 We turned off the Stanley – Myrtleford Road onto Parkys Track and within 50m of the intersection the trail drops suddenly into Myrtle Creek, a shallow and easily traversed stream with a sting in the tail: the exit on the far side is very steep, with a muddy step followed by a hard 30m climb on loose dirt. After this, Parkys Trail climbs very steeply uphill with the surface varying from loose dirt to very loose gravel mingled with even looser rocks. There is a temporary respite at the intersection of Parkys and the Jeep Track and it’s worth stopping here, hopping out of the vehicle and taking a peek down the Wagon Trail that goes off towards the east from this point. If you thought Parkys was steep, try that. Fortunately the Jeep Track is the one that takes you to the Summit, but it is extremely steep and loose and it has quite a few steep-sided “speed humps” with deep troughs on the uphill side. Eventually the trail winds up through woodland to the Summit, and we arrived there with a feeling of relief. The 4WDing was exhilarating but bone-shaking and we were glad to have arrived. 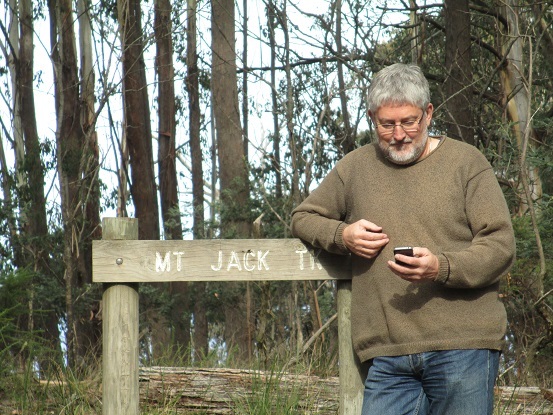 There is a large Telstra installation on the Summit and we cast around a little to find a spot within the activation zone that gave a bit of distance from the potential noise sources that such things often contain. 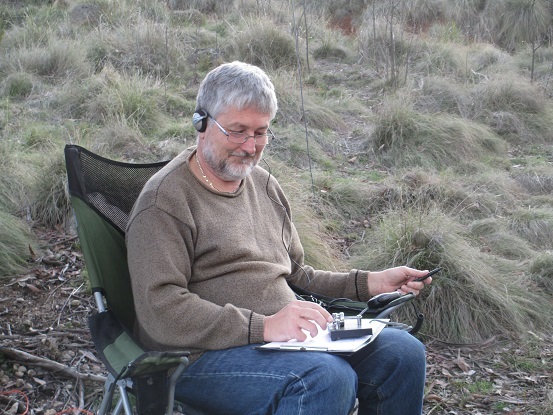 We found a suitable spot near a low gum tree that was just right to serve as the antenna support and once again got the station on the air in about ten minutes. I posted a spot via SOTA Watch – no problem given that I was within 30 metres of the base station! – and opened the account on 7MHz SSB. In about 15 minutes I worked VK2IO, VK3FPSR, VK3EK, VK3ASC/P (S2S), VK1MA, VK2CCJ, VK3FQSO, VK5LY, VK3VZZ, VK3PF/M, VK3ERW/P, VK1DI, VK3BYD and VK3HRA/P (S2S). After a short break and a cup of tea I popped out the links and went up to 14MHz, where a bit of judicious hunting around produced VK2DAG/P (S2S), S58AL and 2E0YYY/P (S2S) on SSB and G0PEB/P (S2S) and OK1CZ on CW. By this time the sun was dipping below the hilltop behind us and the temperature was starting to fall, so even though 14MHz was just beginning to open up to Europe via the long path we reluctantly decided to pack up and head home. The trip down from the Summit to the village of Stanley was a marked contrast from the rough, bone-shaking trip up! On the way down we stopped to rescue a cyclist who’d got a flat tyre, saving him a long walk down the hill. He’d ridden his road bike all the way to the summit and was on his way down again when he got the flat. The trail up from Stanley really is smooth enough for road cycling. Don’t forget to set waypoints for the places where you need to turn off a main road onto a trail. Signposting can be hard to see, inaccurate or missing altogether. If you’re contemplating a bit of 4WDing, check out the contours. Some of the alleged “roads” in this part of the world are steep! Time may be an illusion but the arrival of autumn surely is not. Rug up unless you want to bail out as soon as the sun starts getting low.